Return a pointer to the step handler which performed the generation of this step. Return a pointer to the Collision to which this step belongs. A reference to the set of all particles in this step. A reference to the set of outgoing particles in this step. A reference to the set of intermediate particles in this step. A reference to the vector of sub-processes introduced in this step. Return true if no new particles were introduced in this step. Return a clone of this step. Setup pointer to the Collision. Setup pointer to the step handler. The set of all outgoing particle in this step. The set of all intermediate particle in this step. The vector of all sub-processes introduced in this step. The set of all particles available in this step. Pointer to the collision to which this step belongs. Pointer ot the step handler which performed this step. Describe concrete class with persistent data. 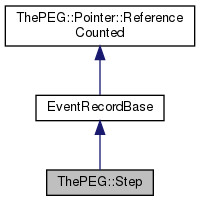 The Step class contains information of all particles present after certain step in the event generation. There is also information about particles which were introduced as intermediate ones in the generation of the step. The Step may also contain one or more SubProcesses which were generated in the step. The Step is linked back to the Collision to which it belongs, and there may be a pointer to the StepHandler which generated the step. Definition at line 34 of file Step.h. newCollision the Collision to which this Step belongs. newHandler the handler object in charge of the generation of this Step. Definition at line 51 of file Step.h. Add a particle to this Step. It is assumed to be already setup as a child to a parent particle. The parent is removed from the list of final state particles in this step. No consistency checks are performed. If the parent is present in this step or if it has immediate children in this step, insert the child and fix up references between the two. If the parent is among the final state particles, remove it (or make it intermediate if it was initially added to this step). The parent/child pointers of the affected particles will be set accordingly. If both the parent and child/children are coloured and fixColour is true, the colour flow will be set. true iff the addition succeeded. Referenced by addDecayProduct(), find(), and removeDecayProduct(). If the parent is present in this step or if it has immediate children in this step, insert the range of children and fix up references between the two. If the parent is among the final state particles, remove it (or make it intermediate if it was initially added to this step). The parent/child pointers of the affected particles will be set accordingly. If both the parent and children are coloured and fixColour is true, the colour flow will be set. The colour of the parent will then flow to the first added child, while the anti colour will flow to the last added child. Definition at line 217 of file Step.h. References addDecayNoCheck(), addDecayProduct(), and removeDecayProduct(). It is assumed to be already setup as a child to parent particles. The parents are removed from the list of final state particles in this step. No consistency checks are performed. Add the child as a decay product of all the listed parents. The parents must satisfy the same requirements as in the addDecayProduct(tcPPtr,tPPtr,bool) function. If any of the parents fail false is returned and nothing is changed. The parent/child pointers of the affected particles will be set accordingly, but no colour flow wll be set. If checkfinal is true the parents or its immediate children must be in the final state. Add the children as a decay products of all the listed particles. The parents must satisfy the same requirements as in the addDecayProduct(tcPPtr,tPPtr,bool) function. If any of the parents fail false is returned and nothing is changed. The parent/child pointers of the affected particles will be set accordingly, but no colour flow wll be set. Insert particle p into with the Inserter o if p is a member of the final state of this Step. Otherwise call the method for the children of p if any. Add an intermediate particle in this Step. If this Step belongs to a Collision, the particle will also be added to the Collision. If this particle has not previously been in a step, the birthStep pointer of the particle will be set. The particle will be removed from the list of final state particles if present. Add a range of intermediate particles in this step. If this step belongs to a Collision, the particles will also be added to the Collision. If any particle has not previously been in a Step, the birthStep pointer of the particle will be set. The particles will be removed from the list of final state particles if present. If this step belongs to a Collision, the paticle will also be added to the Collision. If this particle has not previously been in a Step, the birthStep pointer of the particle will be set. Add a range of particles to this Step. All outgoing particles are added to the list of outgoing particles in the step. All other particles in the sub-process will be added to the list of intermediates. Return the anti-colour neighbour of the given particle if one exists in the final state of this Step. The anti-colour neighbour has its anti-colour connected to the same colour line as the given particles colour. Will return null if the given particle is not in the final state of this Step. Return the (anti-)colour neighbour of the given particle if one exists in the final state of this Step. The colour neighbour has its colour connected to the same colour line as the given particles anti-colour. Will return null if the given particle is not in the final state of this Step. If the given Particle is present in this step, insert a copy and remove the original (or make it intermediate if it was initially added to this step). Returns the new Particle if the copy succeeded. If the copy fails, nothing is changed. For a successful call copyParticle(p)->previous() == p is true. Print out debugging information for this object on std::cerr. To be called from within a debugger via the debug() function. Definition at line 153 of file Step.h. References addDecayProduct(), all(), ThePEG::Pointer::const_ptr_cast(), copyParticle(), insertCopy(), ThePEG::member(), and setCopy(). Fix the colour flow of particles which have been added to this step and which have not already had their colour neighbours set. If a neighbor is found which has not been added in this step, it is first cloned in order not to compromise the colour flow of previous steps. This method should not be needed with the current ColourLine representation of colour. Given a container, return the ones which belongs to the final state of this step. If a particle does not belong to these, it's children (or next instance) will be checked and possibly added instead (recursively). Definition at line 392 of file Step.h. References addIfFinal(), clone(), getSinglets(), Init(), operator=(), persistentInput(), persistentOutput(), rebind(), and removeEntry(). Extract all final state particles in this Step. a vector of pointers to the extracted particles. Definition at line 101 of file Step.h. Return a vector of particle vectors with colour-connected partons, where each particle vector is in a colour singlet state. Use the corresponding functions in ColourLine instead. Definition at line 113 of file Step.h. Used internally by the public getSinglets(...);. Returns the colliding particles in the collision to which this step belongs. (If this step does not belong to a collision, this method will probably cause a segmentation fault - This should be fixed. Definition at line 533 of file Step.h. If the given particle is present in the current Collision, insert copy of that particle 'before' the particle. If the particle does not belong to the current collision or if the copy failed, nothing is changed and the null pointer is returned. If successful insertCopy(p)->next() == p is true. The parents of the original particle will become the parents of the copy. Particle p is added so that if child previously was the child of parent, afterwards p will be the child of parent and child will be the child of p.
When a Step is cloned, a shallow copy is done first, then all Particles etc, are cloned, and finally this method is used to see to that the pointers in the cloned Step points to the cloned Particles etc. Remove the child form the given parent. The child is not removed from the decay record. Referenced by addDecayProduct(), and removeDecayProduct(). Remove children form the given parent. The children are not removed from the decay record. Definition at line 252 of file Step.h. References addDecayProduct(), addIntermediate(), addIntermediates(), addParticle(), addParticles(), addSubProcess(), antiColourNeighbour(), colourNeighbour(), fixColourFlow(), insertIntermediate(), nullStep(), removeDecayProduct(), removeParticle(), and removeSubProcess(). Remove a particle entry from the step. Make its ancesters (if any) present in this step. Remove (recursively) the given Particle from the Step. If this was the last daughter of the mother Particle, the latter is added to the list of final state particles. All incoming and outgoing particles are removed as well. Extract particles from this Step which satisfies the requirements given by an object of the SelectorBase class. r an output iterator specifying where the extracted (pointers to) particles will be appended. s SelectorBase object defining which particles should be extracted. Referenced by collision(), and selectFinalState(). Definition at line 93 of file Step.h. Make particles copies of eachother. Declare that pold and pnew are two instances of the same particle. If pnew is not present in the step it will be afterwars. Afterwards pold == pnew->previous() && pnew == pold->next() is true. Returns false if something went wrong. Most of the Event classes are friends with each other. Definition at line 39 of file Step.h. Definition at line 41 of file Step.h.